Here's another literary tie-in with the new James Bond film. 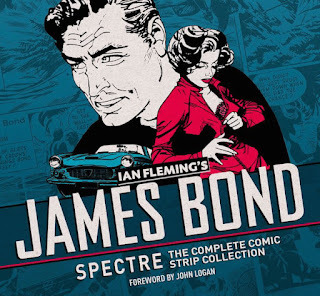 James Bond: Spectre: The Complete Comic Strip Collection will be released by Titan Books in the UK on October 23 and in the U.S. on November 24. The book will include a forward by SPECTRE screenwriter John Logan. Notice how the cover art uses a similar background color as the SPECTRE poster? The daring James Bond is back, this time in a lavishly put together collection celebrating the iconic SPECTRE storylines. Featuring Thunderball, On Her Majesty's Secret Service, You Only Live Twice and The Spy Who Loved Me. These fully restored and thrilling stories are based on the original Ian Fleming James Bond novels. Wait, The Spy Who Loved Me a SPECTRE story? Well, yes. The criminal organization was written into the original Daily Express comic strip from which these Titan collections are composed. SPECTRE also played a large role in the Daily Express continuation Bond strips throughout the 1970s with the organization being run by a female Blofeld know as "Madame Spectra." Pre-order James Bond: Spectre: The Complete Comic Strip Collection on Amazon.com (U.S.) and Amazon.co.uk (UK). SPECTRE is referenced in "The Spy Who Loved Me" but of course they're not the main objective in the book. The Horak/Lawrence adaptation of TSWLM is rather good. The first half is based on the story Bond told Vivianne about SPECTRE agents i Canada. The second part is pretty much a straight adaptation of Fleming's novel. When the comic strip was syndicated in the Swedish Semic comic magazine "James Bond Agent 007" it was actually split up as two stand-alone adventures, the first of which was given the title "Operation Spökflyg" (Operation Ghost Flight). As you pointed out, John, SPECTRE and Madame Spectra were used in several of the Daily Express strips during '70s, coming to a climax with the Harry North-drawn Doomcrack in the early 80s. Thus calling this collection "Spectre: The Complete Comic Strip Collection" is a bit misleading. Why not collect all of the SPECTRE-strips? "another literary tie-in with the new James Bond film..." What is the other tie-in to the new James Bond film? I tried searching for your previous entries but failed to see one. I belive he means TRIGGER MORTIS. Hey Abdul. Sorry, I should have offered a link. I was thinking about this one. Thank you for the replies. Have a good day.